The Best Kind of Progress Isn’t Something You See. It’s Something You Feel. Okay, so it might be because I ate approximately 80,000 calories worth of crusty, cheesy fried-then-baked eggplant parmesan, leftover spinach feta quiche, and German pancakes drizzled with a homemade sugary syrup yesterday. 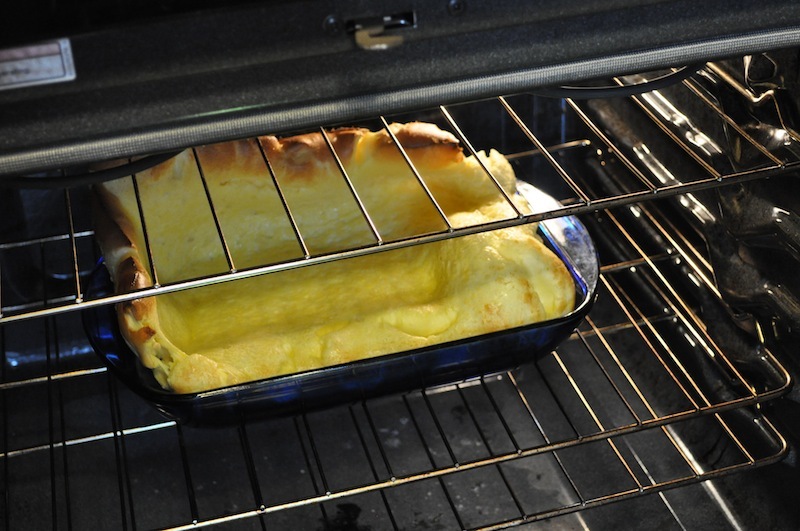 Check out that Dutch Baby, baby. And please ignore my filthy oven. Or it might be because I just ordered 26 galvanized malleable floor flanges from Amazon before having even one sip off coffee this morning. Or it might be because I spent the entire day yesterday, aside from a 2-mile walk with the dogs and shoving approximately 80,000 calories worth of delicious, artery-jamming crap into my system, sketching out a design for a closet organizer made entirely out of plumbing fixtures and pine boards. It might be one of those things. But whatever it is, I’m feeling mighty accomplished this morning. On second thought, none of these things are the reason I feel accomplished. They’re most certainly the reason I feel fat, but not the reason I feel accomplished. But first, I need to take you back to Saturday. Saturday, my friends, is the day I made an important and disturbing discovery about the person with whom I’ve chosen to live (aka. my husband). This discovery wasn’t a complete surprise, mind you, since inklings of this issue’s existence have been cropping up, here and there, for the past 9 years. 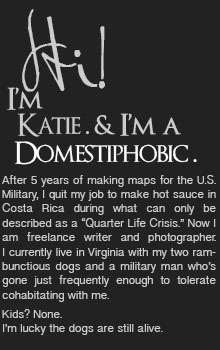 But apparently I’ve been living in a protected shell of denial. Apparently I haven’t wanted to make this discovery, because then I’d have to admit that the issue exists. But on Saturday, I could ignore it no longer. I ventured out to The Shed. The Shed is a wonkily assembled, pseudo mini building attached to the back of our house, presumably added by the previous owners. When we moved in 5 years ago, I quickly labeled the non-ventilated space as man territory, clearly, and have rarely ventured back since. On Saturday, I walked into The Shed. Actually, I should clarify. This is after I removed the lawn mower, a weed whacker, a small hand cart, and approximately 35 (or 6) large, assorted bags of garden soil. My husband is a hoarder. It turns out, every time I asked him to get rid of something — like the chicken wire we’d once used to line the inside of our fence to keep the pups from squeezing out — this is where he put it. Not only that, but this is also where he put project supplies that he bought but didn’t want to immediately tackle. So, it turns out, for years we’ve been storing oil-rubbed-bronze doorknobs (all of which we’ve since bought and replaced in the house), outdoor light fixtures (since bought and replaced), and giant bags of garden soil and mulch, all — you guessed it — re-bought and used multiple times over during the years that these things have sat, forlorn and neglected, in the bowls of The Shed. I found bags of trash. I found an unopened, unused seed starting kit. I found a tupperware bowl I’d long – long – since given up finding. Unfortunately, it was filled with oil-soaked newspapers, but still. Finally discovering its fate brought me peace. And so, my dears, did cleaning out that shed. If the difference doesn’t look drastic to you, keep in mind that this “after” photo, as opposed to the “before,” now contains a lawn mower, hand cart, weed whacker, large rake, cylinder of propane (where is the best place to keep this, by the way? 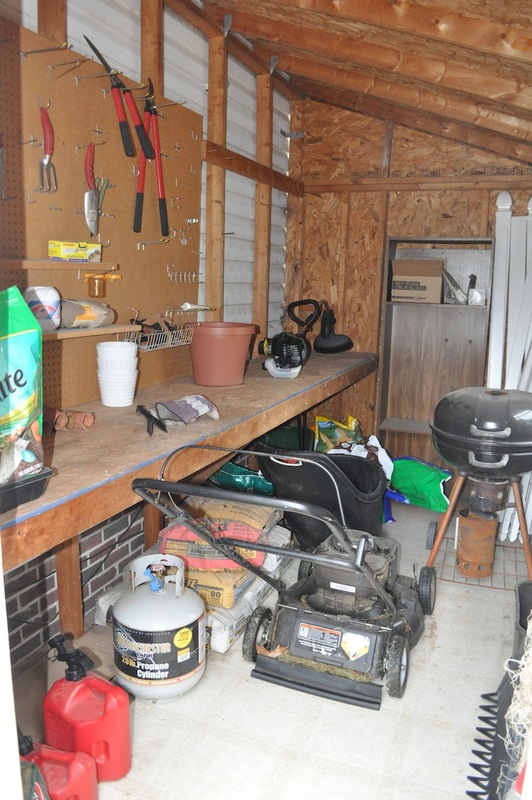 ), and several garden tools and flower pots. I would have carted out the 7 bags of concrete mix, but I found that moving one from the bookshelf in the back to the rest of the pile may have caused me permanent back damage (just kidding — I think), so there they will stay. This discovery was important because it made me admit — finally — that while Justin is an out-of-sight, out-of-mind type of person, I’m most definitely an it-might-be-out-of-sight-but-it’s-still-right-there-in-mind-so-it’s-still-giving-me-an-eye-twitch type of person. And also, call me crazy, but I like to be able to access things without wading through a pile of garbage. But — and pay attention because this is important — if I can just accept the above statements as fact and realize that Justin is about as likely to change his habits as I’m likely to sit in a cubicle for the rest of my life, then we’re one step closer to reaching a symbiosis that actually… I don’t know… might allow us to get things done. A partnership, if you will. Photo taken, unfortunately, on a much drearier day. What happened on Saturday is that I made a mental leap. One of acceptance, if not understanding. And that, I think, is what we call accomplishment. All I can say is OH-MY-GOD do I know how you feel. I’ll admit I’m a bit of a control freak when it comes to having things organized and clean but like my mother always said, “cleanliness is next to godliness.” The most disappointing part is discovering that someone dear to you is dare I say it, a hoarder. You spend all this time building it up inside your head that they retain the common sense to understand that keeping things organized it is much MUCH easier to get at what you need. Especially when an idea pops into your head that requires a bag of concrete at the back of your shed. My father is the ultimate hoarder and although my mother and I have kept him under control for the most part it has come to the point to forbid him from entering or placing anything in our storage room. I’m sorry but shoving random items wherever you can fit them because you have no room to put things IS NOT THE ANSWER. Thank you for this article, by far my favourite. It made me realize that there are other crazies out there besides myself. P.S. 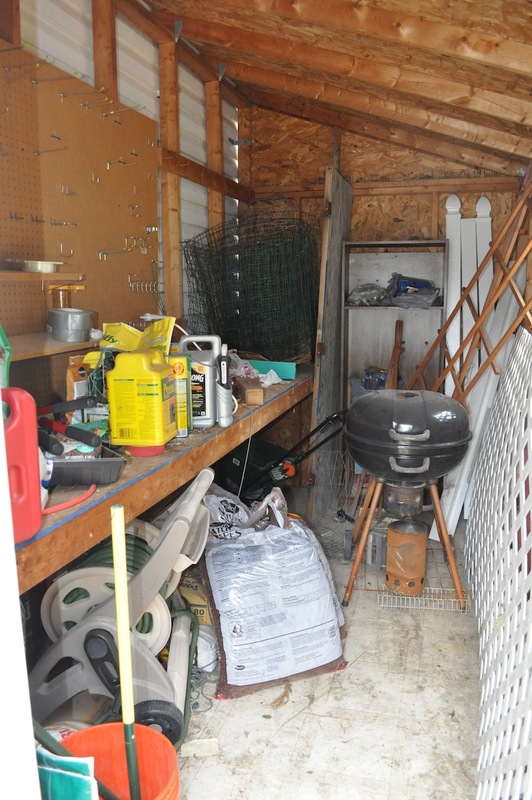 I should also mention for your own safety, if your shed gets really warm in the summer time, storing a propane tank in there would not be the best decision. Unless of course it is empty. It makes me clench my jaw. Seriously. It’s like… we are actually buying things that you have already bought and either a) forgot about completely, or b) know you bought but have no clue where it is, or c) know you bought and know where it is but also know it would take too much effort to reach so you’d rather just buy a new one. Phew. Rant over. I’m glad someone feels my pain. If you consider that hoarding, you’d run away screaming from our garage. The inside of the house is mine, and the garage falls under my husband’s jurisdiction. It’s a total embarrassment. 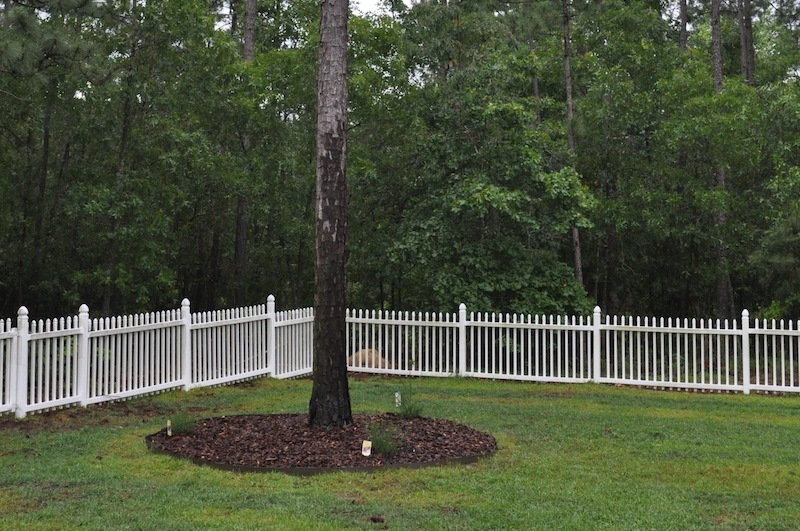 Your shed looks great now, and so does your tree. Thanks for sharing. 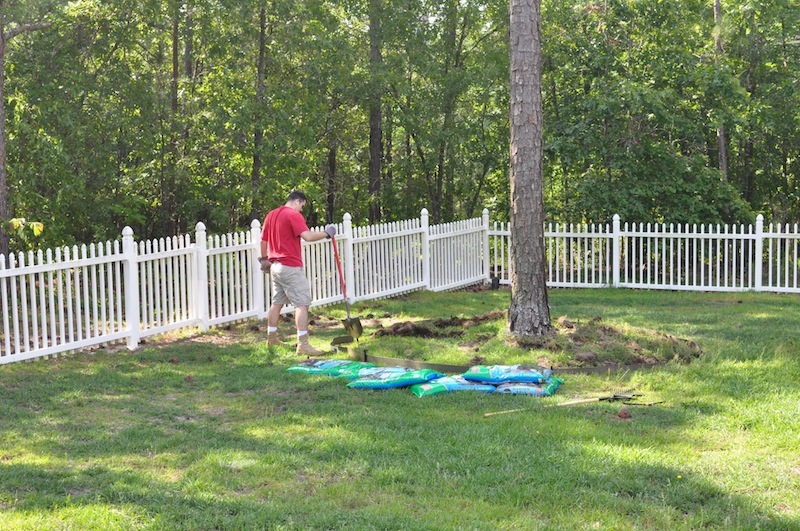 You both should feel very accomplished for your projects…Clean shed and nice, new flower bed. Good work! I failed with the pictures. I had already taken several items out for the first shot, and the second shot has several LARGE items that the first did not contain. So the difference doesn’t look as drastic as it really was. And, like I told Lax, I haven’t even shown you the garage. At least your husband is an actually woodworker who has an excuse for storing these things and knows which pieces are worth saving! Know what I pulled out of that shed? Huge sheets of old trellis, an old pallet, and our old MAIL BOX POST. A mail box post. Seriously? Why?? ?